Be the first to hear about their new releases and deals. Download the Booksprout app and search for Lakyshia L. Shelton today! Lakyshia born September 21 1988 in Pahokee Fl also raised in Clewiston Fl to the parents Mary & Lorenzo Shelton. Lakyshia is the youngest of her host of siblings and mother of two sons. Lakyshia begin writing in 2008 but it wouldn't be until 2013 that she would become a self published author. Lakyshia loves to write as a way to channel her anger and emotions. Lakyshia have published 11 books since 2013 and is trying to break her way into the writers world as a known author. 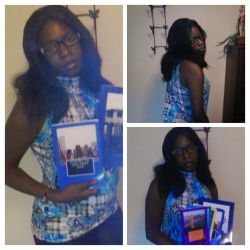 Lakyshia writes fiction and non fiction books as well as poetry. Lakyshia says she keeps God ahead of her life because without him none of this would be possible. Lakyshia says thank you for taking the time out to read about her and her work.